Seed and dice jalapeno peppers. Mince garlic. Chop herbs roughly. Combine olive oil, vinegar, parsley, cilantro, bay leaf, jalapeno peppers, salt, and pepper in the bowl of a food processor, process for one minute. Set aside. Preheat grill for approx. 15 – 20 min. or cast-iron skillet over medium heat for approx. 1 – 2 min. Add some olive oil. Season the skirt steak with kosher salt and pepper and sear the first side for approx. 2 - 3 min. before flipping to cook the second side. Cook to the desired degree of doneness. Remove and allow to rest. Warm tortillas in an oven, skillet, or on the grill before serving. Serve by slicing the steaks into thin slices, always cutting the steaks against the grain of the meat for maximum tenderness. 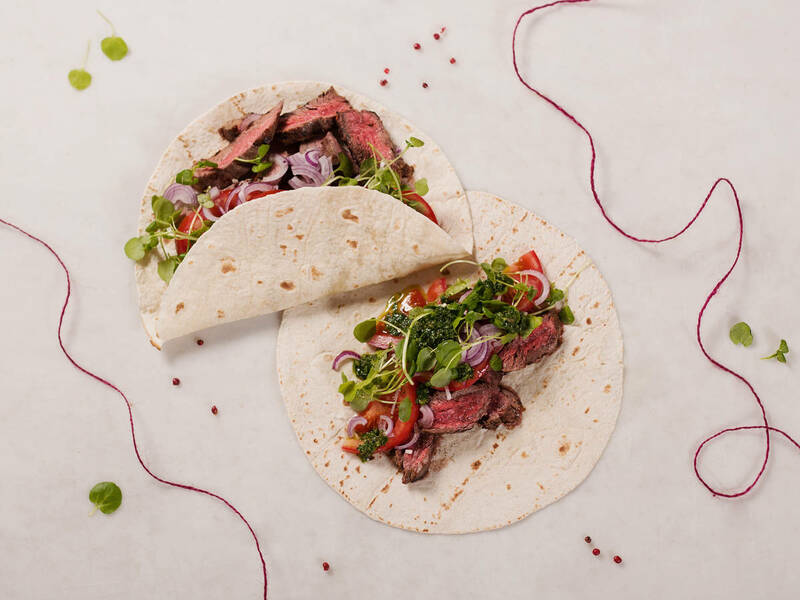 Place sliced skirt steak on a tortilla. Add sliced tomato, sliced onion, and watercress. Then, drizzle with chimichurri. Fold and serve with more chimichurri.